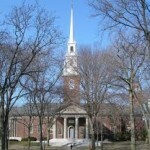 Harvard had a distinct chapel as early as 1744, its location changing regularly until Appleton Chapel settled into the present site in 1858. 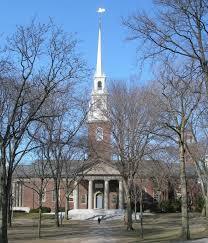 Though long outgrown, it was not replaced until 1932, when Coolidge, Shepley, Bulfinch & Abbott, successors to H.H. Richardson, erected the present structure as a war memorial. The ponderous columns of the porch announce a prosperous, well-fed neo-Georgian style, a suitable counterweight to the bulk of Widener Library and Richardson’s masterful Sever Hall across the Yard. Aeolian-Skinner’s Opus 886, designed and finished by G. Donald Harrison, had 120 ranks with seventeen more and a large gallery section prepared for. While meant to be a pace-setter of orthodoxy, with complete flue and reed choruses on all manuals and pedal, its English bent and smothering chambers yielded a tone more Beef Wellington than Dover Sole, not unlike the chaste-in-principle but plump-in-result architecture. 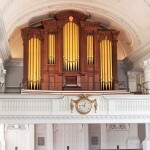 When Charles B. Fisk (Harvard ’49) turned his attention to The Memorial Church, he hoped to install an organ in the gallery. 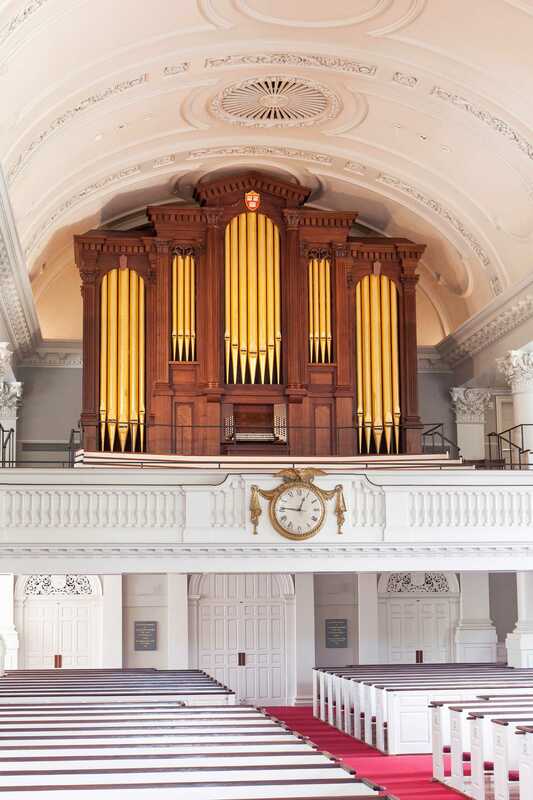 Overruled by no less than Harvard President Nathan Pusey, the new Fisk Opus 46 took root at the head of Appleton Chapel in front of the Palladian window, from where its tone hoped to claw its way past the heavy screen and into the main church. 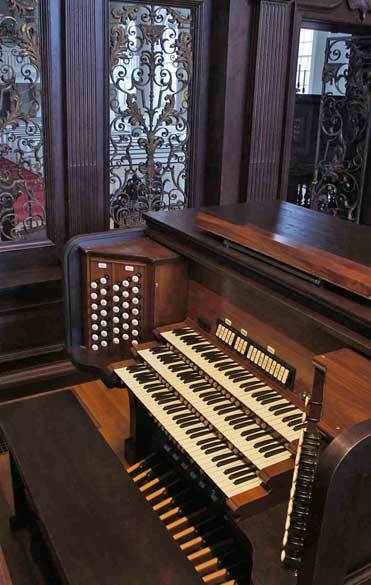 The first four-manual American tracker organ built in the twentieth century, its disposition reflected the conditions at hand: a strong-toned Great and Positive on top, softer Swell and Choir down low for daily use. Opus 46 won over its players perhaps more than audiences, however, and in time came to be seen as compromised as its predecessor. 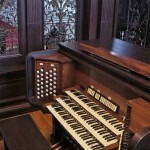 The two organs now in The Memorial Church reflect lessons from the first two instruments. A recycled 1930 three-manual Skinner, re-engineered and reconditioned by Foley-Baker, Inc., was installed in the chapel chambers; what once contained 120 ranks now have forty-five. This instrument leads daily Morning Prayers (voluntary, hymn, choral selection) and is occasionally heard in recital. The 2012 gallery Fisk, housed in a case of nineteenth-century antecedent with brilliant gilt façade, has forty-three independent registers and a tonal scheme in that builder’s modern eclectic style. Ingeniously engineered into a limited space, the organ speaks directly into the church to lead Sunday worship, for which the choir joins it in the gallery. Convention Photographs by photographer Will Sherwood are available here . Handouts received for Workshops/Scholarly Research Papers are available here . © Copyright 2019	AGO Boston 2014. All rights reserved. Site design and hosting by North Forty Road.